A scientist wakes up one morning to discover the world is strangely silent - everyone has disappeared, thanks to a botched atomic experiment that has rendered the fabric of the galaxy unstable. At first he has fun doing anything he wants to but gradually isolation take hold. Then he discovers he is not alone - two more emerge to join him. New Zealand's first, and best, contribution to the sci-fi genre. The 36 minute solo beginning performance by Bruno Lawrence is unequaled in film history. The original soundtrack is certainly one of the best to be found in a New Zealand film. Highly recommended. Used PAL VHS have been seen for about 5#. Used NTSC VHS copies can be found via ebay and amazon auctions at $10us. On June 13, 2006, Anchor Bay released a new R1 NTSC dvd package in 1.85:1 widescreen, enhanced for 16x9, that contains dolby digital 2.0 surround and has English closed captions. It contains the trailer, an optional audio commentary track by Sam Pillsbury, as well as an eight page booklet containing a lengthy article written by Richard Harland Smith. It is packaged in a "Steelbook" case, with a metal exterior and a plastic interior. As of February, 2011, it is OOP and therefore new copies are selling for $35us. or more. In 2007 it was re-released but in a standard case, not the 'Steelbook' case. All specs are the same, except it does not have closed captions and sells for about $20. An R0 NTSC is available in New Zealand, selling for about $20nz, and in Australia for about $25au. It also contains the optional audio commentary track by Sam Pillsbury and the theatrical trailer, but no subtitles. An R0 PAL bare-bones version is available from UK sources for about 7# or from NZ sources for about $15nz. In July 2011, an all-regions (although it incorrectly states Region B on the box slick) Blu-ray version was released in Germany. It sells for $10-15eur. It is 1080i 1.85:1 (not 2.35:1 as indicated on the back cover) with spoken DTS-HD Master 5.1 or original DD 2.0 in either English or German. There are optional German subtitles. There are some problems with the audio menu, so I would recommend going straight into play and then access your player's menu to change the audio or subtitle options. There are five audio track options that have labeling flaws: Track 1 is German DTS-HD MA 5.1, Track 2 is German DTS-HD MA 2.0, Track 3 is English DTS-HD MA 5.1, Track 4 is English DTS-HD MA 2.0, Track 5 is the DTS-HD MA 2.0 English commentary track by Sam Pillsbury. 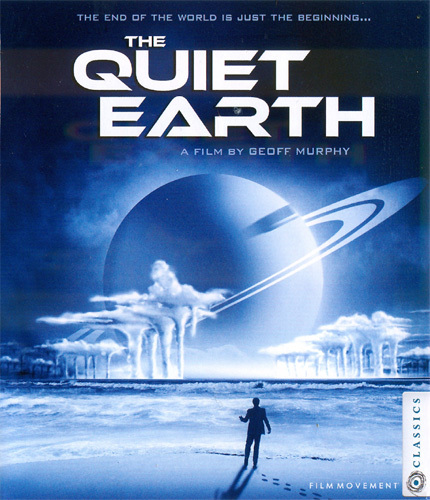 The Trailers section includes a 1.33:1 English trailer of The Quiet Earth, with German subtitle option. The trailer section also includes five unrelated German trailers. There is another Blu-ray offering, that is much the same as the afore-mentioned German release, except that it has subtitles options of: English, German, Spanish and Portuguese. I have not had an opportunity to test this one, but it is also a 1080i; hopefully it does not have the same menu problems. The German "Atlas Alive" offering had a re-issued 30 September 2016 and seems to have the same specs as their previous one, except it is listed as being 1080P and has a list price of 15eur. I would appreciate hearing from someone who has this lastest 'Atlas Alive' version confirming as to whether it is a 1080p and what your opinion is about its tech quality. The latest release came on 06 December 2016 with North American releases on NTSC R1 DVD and a 1080p ALL REGIONS Blu-ray. They are restored 2k HD with a commentary track option featuring astrophysicist Neil deGrasse Tyson and film critic Odie Henderson. The BD-50 Blu-ray is 1080p with DTS-HD-MA 5.1 English track. There are no subtitles. There is a Quiet Earth trailer plus some other unrelated trailers. The package also contains a 16 page collector's booklet with an essay by Teresa Heffernan. The full list price is $25us for the DVD and $40us for the BD, but they can be purchased for less. Another Blu-ray release started 18 June 2018. It is a Region B Arrow Video (UK) issue that sells for 18-25#. It has spoken English DTS-HD-MA 5.1 and LPCM 2.0 Stereo options as well as optional English subtitles. Extras include: a new audio commentary by critic Travis Crawford, a new video essay by critic Bryan Reesman, a new interview with critic Kim Newman on the post-apocalyptic movies of the 1980s, the original theatrical trailer, a stills gallery and a reversible sleeve featuring original and newly commissioned artwork by Laz Marquez. The commentary track and all the extras are LPCM 2.0 spoken English. NOTE: With the first pressing only, an illustrated collector's booklet is included featuring new writing by Amy Simmons. A new ALL-Regions Blu-ray, with a DTS-HD-MA 5.1 English soundtrack and optional English subtitles, was released for Australia and New Zealand starting 03 October 2018 and selling for $25-30. It's extras include an audio commentary track by Sam Pillsbury, trailers and an image gallery. German HD Reporter Blu-ray Review. 1986 - Fantafestival - Best Actor: Bruno Lawrence; Best Director. 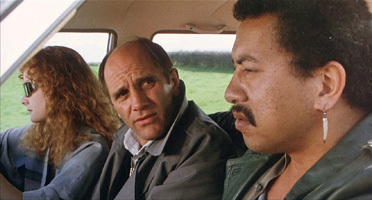 1987 - New Zealand Film Awards - Best Film; Director; Leading Male: Bruno Lawrence; Supporting Male: Peter Smith; Adapted Screenplay; Cinematography; Editing; Production Design.